Strapline "Survive together or die together"
Freshly installed in their new overseas home in Southeast Asia, the Dwyer family find themselves caught in the middle of a coup. Soon realising their lives are in danger, they frantically look for a safe escape in an environment where foreigners are being immediately targeted. So, an awful August is finally drawing to a close, and the summer season now resembles a camp fire the morning after. 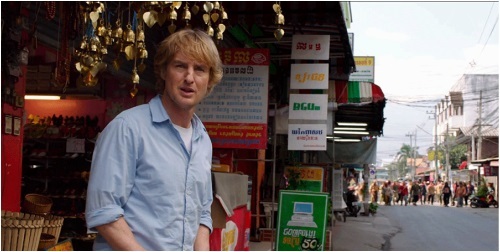 Just squeezing through the door before August shuts up shop is Owen Wilson's No Escape. 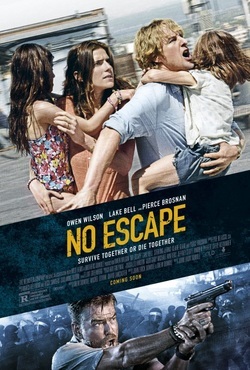 No Escape is a very enjoyable tense action thriller, that is as unrelenting as it is unflinching. The movie sees Wilson break new ground in the action thriller genre. With the sole exception of action war drama Behind Enemy Lines (2001), serious action or drama movies have not been the forte of the 47-year-old with the famous Southern drawl. Action movies that he has starred in have been classed as comedies such as Shanghai Noon (2000), it's sequel Shanghai Knights (2003), I, Spy (2002) and Starsky & Hutch (2004). This time he plays it straight but his sheer number of comedic roles has left his talent for straight drama a little wanting as he gives a relatively impassive performance. Although conveying a suitable level of "Oh my god what is happening to me and my family" In the most extreme moments of pressure and distress he just wasn't able to give the performance that was called for with this character. In all honesty, he is upstaged by Lake Bell who plays his on-screen wife Annie. She steals the show and gives a very convincing but natural performance of a mom and wife who has literally been thrown into the jaws of hell as she desperately tries to help protect her precious daughters. As for Pierce Brosnan, ever since his last turn as James Bond in the huge misfire that was Die Another Day (2002), his status as an action star has been on the wane with duds like After the Sunset (2004) and more recently The November Man (2014) and Survivor (2015). If it wasn't for roles in movies such as Mamma Mia (2008) and The Ghost (2010), Brosnan may well been destined to a direct-to-DVD future, post Bond. Although woefully underused, even bordering on the line of an extended cameo, Brosnan does show a sharpness about him that has not been seen since his heyday as 007. Therefore one would hope that No Escape will provide a much needed shot in the arm for the Irish actor's ailing career. What I liked about the movie was the genuine sense of peril and distress this innocent family were experiencing. I was on the edge of my seat at times as their situation just went from bad to worse. The tension in the audience at times was palpable, it's no surprise therefore to learn that director Dowdle comes from a background of directing horror movies, as his skills for the most part where used to great effect. Having said this there were some nice moments of humour interjected to break the tension at times. Despite Wilson's relatively wooden performance, they were plausible as a family unit, this was largely due to Bell's effort, which I have previously touched on. As a result I really felt for them and their utterly nightmarish existence. Going one step further, as a father of children roughly the same age as the girls in the movie it brought it home to me how completely horrific something like this would affect young children. No Escape also wastes no time with a 105 minute runtime of unnecessarily introducing a backstory to this family. It's very simple, they arrive to start a new life in a new country and within 24 hours they are in hell. No backstory needed. Also touching on backstory, the villain in this movie is very effective. He says virtually nothing, and what he does say is not in English. However he is very predatory and unforgiving in his pursuit of his prey. From a visual standpoint the movie is well shot with a good mix of tighter "chase" camera angles as you would expect in this type of movie but also wider shots, the score is neither here nor there. I walked out not even being able to remember the music. I thoroughly enjoyed No Escape. Watching this movie after what has seemed an endless August of horrendous movies, it was finally nice to be engaged once again. There is a very real feeling of tension and terror for this innocent family caught up in a conflict not of their making. Lake Bell steals the show as the family's Mom and Brosnan for the brief time he is on screen gives us shades of the Brosnan of old. The movie is let down though with an fairly bland central turn from Wilson and some situations and set pieces that stretched the imagination.